The W.Howard Group has acquired Balcas Kildare Ltd, Ireland's largest manufacturers of MDF profiles resulting in the formation of a new company - W.Howard Kildare Limited. The Group believes the buyout will significantly enhance the business' commercial offering by reducing lead times and increasing production capacity across its three sites and expand the firm's reach across the UK, Ireland and Europe. The firm, which now has 160 staff, has a site at Newtown in Powys (Polyco Ltd), as well as a dedicated collection and distribution depot in West Thurrock. 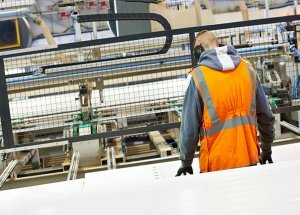 Graham Williams, W.Howard Group managing director, said: "This deal will first and foremost bring confidence in the continuity of supply to our customers, which will be achieved by manufacture at our three separate sites with supply of MDF and chipboard from four major suppliers. "One of our key aims is to ensure that our customers never again feel the pain of limited supply due to serious issues either within our Group or with suppliers. This acquisition provides the platform for achieving that aim. The workforce at Balcas Kildare are highly skilled and knowledgeable regarding the manufacture and supply of MDF profiles, with the added bonus of being able to supply the KOTA product." The KOTA product is a patented system of moulding which is unique to the Irish plant and supplies major retailer BandQ. Mr Williams added: "The acquisition has a positive impact on the future of the business, particular within the Astley area, as it strengthens W.Howard's ability to expand its offering and continue to be an active employer of local people. "We look forward to providing a commercial offer encompassing a radically expanded product range accompanied by reduced and simplified lead times that customers new and existing will find difficult to resist."